Optimist Libby Miller’s life takes an unimaginable terrifying turn. On the very day she learns she has a life-threatening illness, her husband, Tom, reveals a marriage-ending secret. Add to that, she has the most insensitive, demanding boss imaginable, and it’s no wonder she flees her life in Chicago and seeks refuge on Vieques, a remote Puerto Rican Island. You might assume a novel with such distressing themes will be a deeply emotional tear-jerker. Instead, author Camille Pagan imbues the protagonist Libby with enough wit and denial to tell most of the story with a light touch. 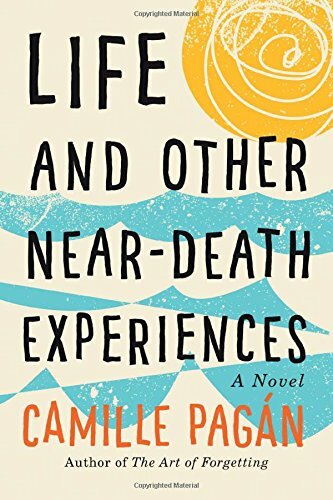 Life and Other Near-Death Experiences has all of the elements of chick-lit: betrayal, girlfriends, family relationships, romance, love, self-discovery, and a convenient tie-up-the-loose-bits ending. Immediately after her husband Tom drops his bombshell, Libby kicks him out, never telling him her own devastating health news. A series of seemingly irrational decisions follow: she puts the house up for sale without informing Tom, sells off the furniture at bargain prices, quits her job, denies treatment. Amid her full-blown meltdown, she decides to keep her health status a secret, even from her father and twin brother, Paul. She and Paul are exceptionally close, and he is her biggest supporter. Her tropical island escape fantasy nearly derails when she encounters a couple more near-death experiences. First, the small plane taking her to the remote island of Vieques nearly crashes, and then she is almost run-down while walking on a back road. Predictably, there are immediate hints of romance between Libby and Shiloh, the pilot of the small, near-miss plane. Libby’s sometimes out-of-place wit, illogical choices, stubbornness and secrecy as she attempts to distance herself from her health crisis, family, and friends, make connecting with her a slow process. She is at her most vulnerable and sympathetic when she reminisces about her mother, who died from cancer when Libby was ten. Viewed through the lens of Libby’s mother’s illness and death, her reaction to her own illness, and her spiral into grief and denial become more understandable. With the help of a kindly neighbor, her new love interest, and brother Paul, who braves his fear-of-flying phobia to be with Libby in Puerto Rico and discover firsthand what is really going on, she reemerges and slowly takes steps to move on and reconstruct her life. Camille Pagan manages to deal with messy, potentially maudlin themes without sentimentality. She tells rather than shows most of Libby’s illness in a way that brushes the surface and spares the specifics. Depending on a reader’s perspective, downplaying the gory details of a serious illness may be a strength or oversight in the story. Carol Brill, MFA, is the author of two novels, Peace by Piece and Cape Maybe, a number of published short stories and essays, and articles on the craft of writing.